We had a busy weekend, most of which we spent outside the house. The weather was beautiful! By the time we went back home yesterday, it was time for the kids to take a bath and after they went to bed, I had no energy for cooking. 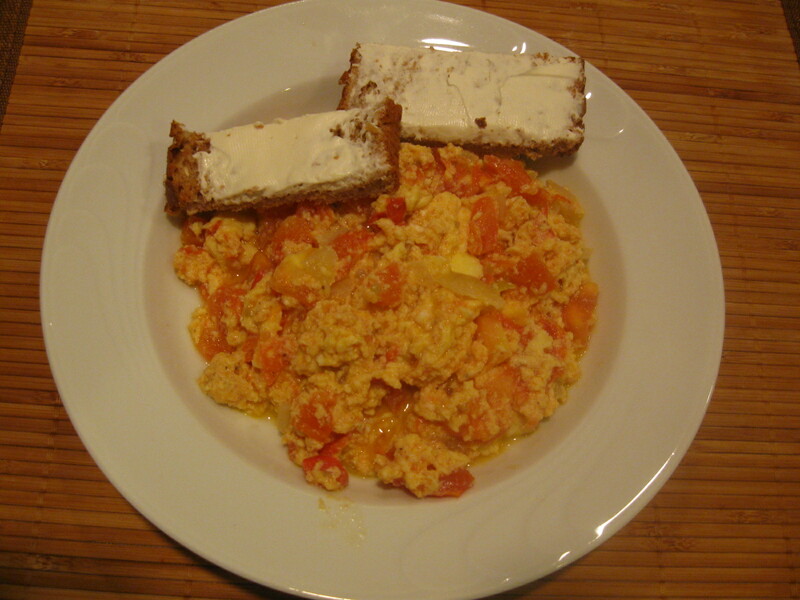 I usually make the “eggs with tomatoes” recipe for a special weekend breakfast but hey, today, it will be dinner! Vicky has posted a recipe for this dish. Vicky doesn’t saute onion and she uses roasted red peppers. You have to serve it right after you cook it, like you’d do with an omelette. How to make: Heat the oil in a pan and saute the onion, about 5 minutes. Add tomatoes, salt, pepper, sugar (one teaspoon should be enough). Cook in moderate heat until tomatoes are soft and there’s not too much liquid. Add beaten eggs and stir slowly with a wooden spoon. As the eggs start firming, add nutmeg to moderate the strength of the `egg’ taste. When the eggs have reached your favorite firmness stage, remove from heat and serve. I served them with multi-grain toasted bread, spread with cream cheese. My kids love it. Notes and tips: Vicky adds sliced green peppers to the tomatoes, which is great. I don’t always have green peppers in my fridge so I use nutmeg, instead. But if you have them, try it. Watch out for “watery” tomatoes. You don’t want your eggs to ‘swim’ in tomato juice. As per Vicky’s suggestion, either skin, salt and strain the tomatoes ahead of time or use good quality canned plum tomatoes. To make skinning easy, dip tomatoes in hot water for a minute. When I use canned plum tomatoes, I tend to forget to add sugar and it’s OK. Vicky sprinkles a little olive oil before serving. In my version, it’s not necessary. After all, I saute the onions in olive oil. If you like oregano, use it.